Sister Andre grew up on a farm 22 miles outside of Dickinson, ND, the second oldest of nine children. She attended country school, and has happy memories of the sisters who came out to teach catechism there. She received the sacraments of First Communion and Confirmation in the Dickinson area. When asked when she first had the idea of becoming a sister, Sister Andre confided, “I requested that of Jesus at my First Holy Communion. That was when I told Jesus that I wanted to become a sister.” But Sister Andre never told her parents of her intention until she was almost 16. When she finally did tell them, they were very supportive, and reassured her that if this turned out not to be her vocation, she was free to come home. 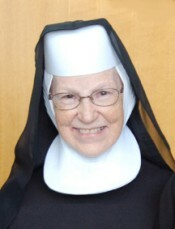 Sister Andre attended high school in Dickinson and then at St. Mary’s. She came to high school as an aspirant, which means that she had the intention of becoming a sister and would gradually be incorporated into religious life, beginning in a limited way even at this young age. At the time, this was a typical path, although not the only way, for young women who intended to enter religious life. Sister Andre found that she did, indeed, have a vocation to religious life. Entering the Benedictine Sisters of Annunciation Monastery, after completing her postulancy and novitiate, her first ministry was at the laundry at St. Alexius Hospital, where she gained valuable experience. She went on to work at the Bishop’s house for 20 years, doing housekeeping, laundry and gardening. Currently, Sister Andre serves in the laundry at Scholastica Convent, where she operates the “big machines” and is responsible for laundering the always-needed supply of towels, sheets, linens, aprons, and other washable items, such as those used in liturgical celebrations. Sister Andre, in her distinctive white (or occasionally black) religious habit, can frequently be seen trotting in sprightly fashion between Scholastica Convent and Annunciation monastery, picking up or delivering items entrusted to her care. For larger items, she has worked out a cooperative venture to ensure that large and bulky laundered items reach their intended destinations safely, for Sister Andre, even though boundless in energy, is of slight build. In addition to her duties in the laundry, Sister Andre also zips to and from town, driving sisters to and from their various appointments, and running necessary errands. Clearly, Sister Andre has found happiness in religious life. Her unique blend of good humor, spiritual wisdom, simplicity of living, and dedication to her work is simply delightful!